Therefore, we had to make a restoration-plan white out pecific historic details. First step was to record al details en make a list of items that where working properly and could be re-used. Second step, we made a rebuilding plan. This first rebuilding plan was based on a tug-like appearance. We had drawings made and all. We where not very happy with the results. Bad parts in the deck forced us to make a decision and go on. In January 2003, we started taking the boat apart. During the break up, we took many photographs. This way we could make sure not to lose the historic details. Under the steel deck we found a wooden deck. Beneath the wooden deck there was another steel deck. We knew that in the rear of the ship there was still the old flat tail-end under the round tug-tail. During the break up, we could see the real shape of the old hull for the first time. Further more we found details like the riveted chainplates and the rivets in the plating under the waterline. These rivets are to close up the old fish-well. The shape, the proportion and fullness of the hull do not mach the normal tug dimensions. 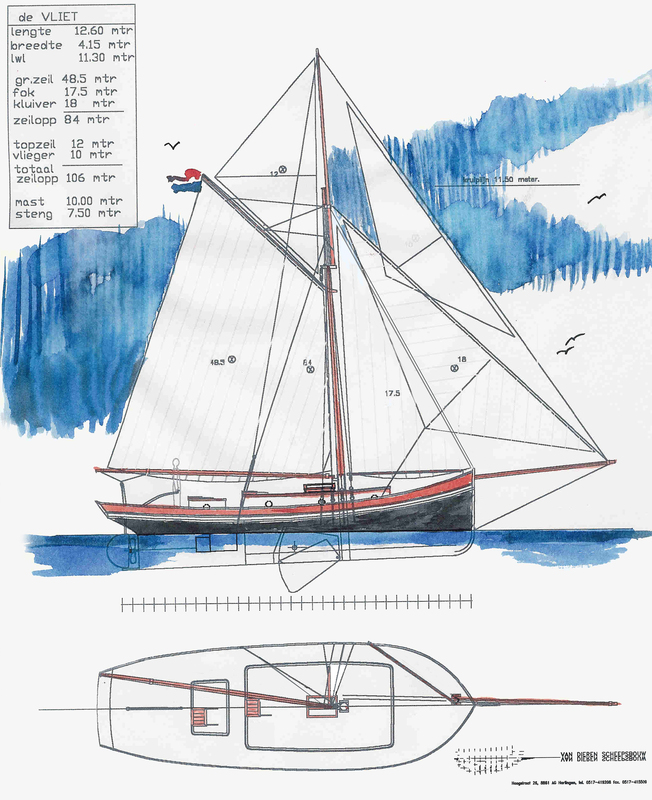 All and all we concluded that our ship had been a fishing-vessel: a sailing fishing cutter of approximately 41,50 feet long and 13,78 feet over the beam. At that moment, we decided to restore her as a sailing vessel again, as she must have been circa 100 years a go. So we made new plans and drawings. At this stage, we could see her altering from the ugly duck into a swan like in the fairytale. To make it also a comfortable and useful ship we decided fit her whit a deck housing. Sleepboothek er weer af in 2002 De lengte is nu 12,65m. Do you have information on the vessel please contact us by email. Why a website about De Vliet? Like many owners of old ships we where not only interested in the boat it self. We where also curious about the history of our boat. Where had she spent her working life? And who sailed with her? 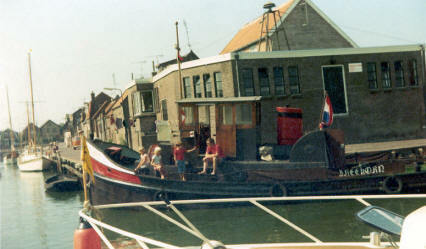 When we bought the boat the previous owner, family Leeuwerke, told us the history, as they knew it. However, when we encountered more people who had owned the ship before their stories seemed to be different and where not fitting in to a complete story. One goal of this website is to put all facts into perspective. On the other hand, we wanted to restore the hull whit respect for the history and as close to the original as we could get her. Back until 1953, we could trace the previous owners. Before this date we do not have any documents to confirm the stories we where told.